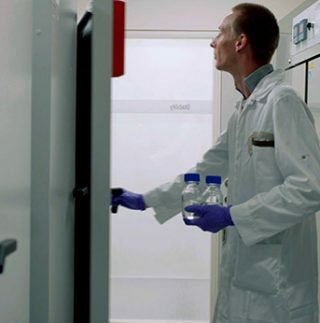 Nelson Labs Europe has gained experience in analyzing stability samples for more than 10 years for evaluation of the leached impurities and interaction with drug matrices. Now, Nelson Labs Europe offers the capability to combine core stability testing services with world-class extractables and leachables. Both stability and leachable programs are run in parallel in order to differentiate drug substance degradation products from impurities, respectively, and expedite your projects. Additionally, we offer identification of unknowns and synthesis thereof, for quantitative monitoring for subsequent stability and/or leachable projects. Nelson Labs Europe has chosen to work with stability chambers, mainly for flexibility in conditions and storage capacity. Chambers are fully GMP qualified and continuously monitored with an alarm system. Backup chambers are available and emergency electric power generators are in place to ensure continuity of the aging process. Other storage conditions are available on request. If you have additional questions about Pharmaceutical Stability Studies testing services, or would like to consult with the experts at Nelson Labs, just send us a request or call us at +1 (801) 290-7500.